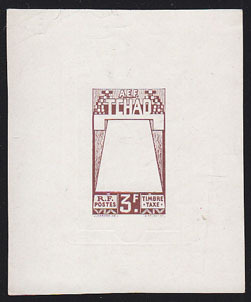 18884 EP CHAD (1930) (Canoe)*. 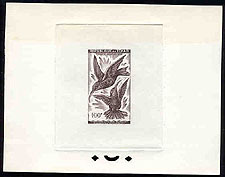 Die proof in black missing central vignette. Scott No J20, Yvert No TT21. 18885 EP CHAD (1930) (Canoe)*. 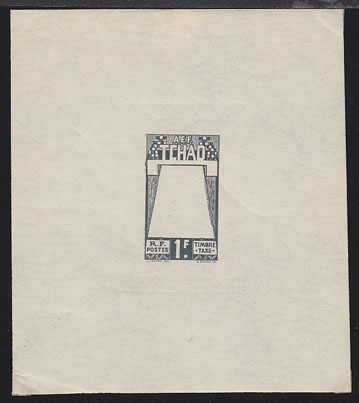 Miniature die proof in brown missing central vignette. Scott No J22, Yvert No TT23. 9659 EP CHAD (1961) Scarlet-chested sunbirds*. Scott No C3. Yvert No PA3. Sepia Printer's Die Proof. Only 4 copies printed. Rarity!